Christmas has officially descended upon us. Charleston's weather is even complying with the season, offering us a brief cold respite. My mom and I set all of our decorations and Christmas trinkets around the house yesterday, and we trimmed the tree today. I could not be happier that it is December 6th, with only 19 days to go. Along with Christmas trees, lights, and carols come Christmas cookies, which are perhaps the greatest part about the holidays. My mom and I went on a baking frenzy, whipping up batches of our traditional cookies to send to relatives; we made oatmeal raisin, peanut butter, and sugar cookies. 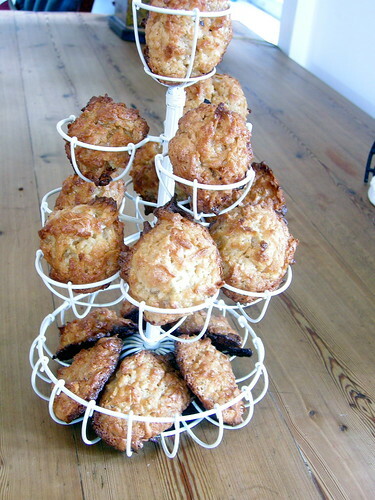 I decided to add another cookie to our holiday arsenal- coconut macaroons. They are special enough to be festive, and they are a welcome change from the extreme sweetness of a lot of the desserts that are prevalent at this time of year. 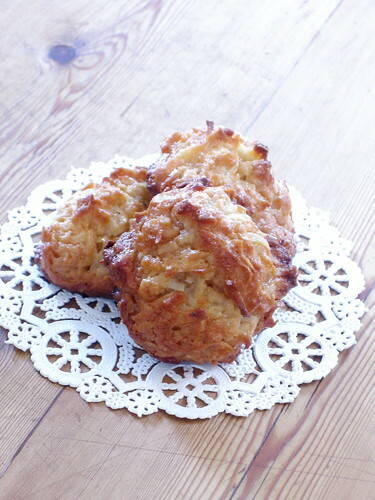 This recipe for macaroons was different than others that I had made in that it directed you to cook the dough on the stove before baking the cookies. I am not quite sure why this is, but I would love to know if anyone has any ideas! 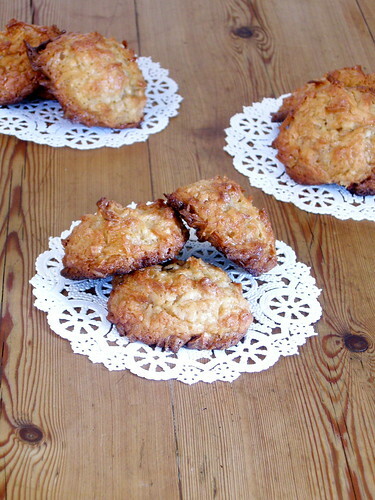 I should also note that I halved the recipe, as I was running a bit low on coconut. The smell was so marvelous that my little brother Riley, who is generally averse to most things besides sugar cookies, said so. These cookies were so, so delicious, and I sincerely hope that their recipient enjoys them as thoroughly as I did. Preheat oven to 350. In a large pan, warm egg whites, sugar, salt, and honey, stirring over medium heat. When egg whites are warm to the touch, stir in coconut, flour, and vanilla. Continue cooking over medium heat, stirring constantly, until mixture is slightly dry and bottom has just begun to sizzle and scorch. Cool. Form mixture into 1 1/2-inch mounds with your fingers and space them evenly on a parchment-lined baking sheet. Bake for 18-20 minutes, rotating halfway through. Let cool. this and the pistachio cake look very very yummy !!! very nice.